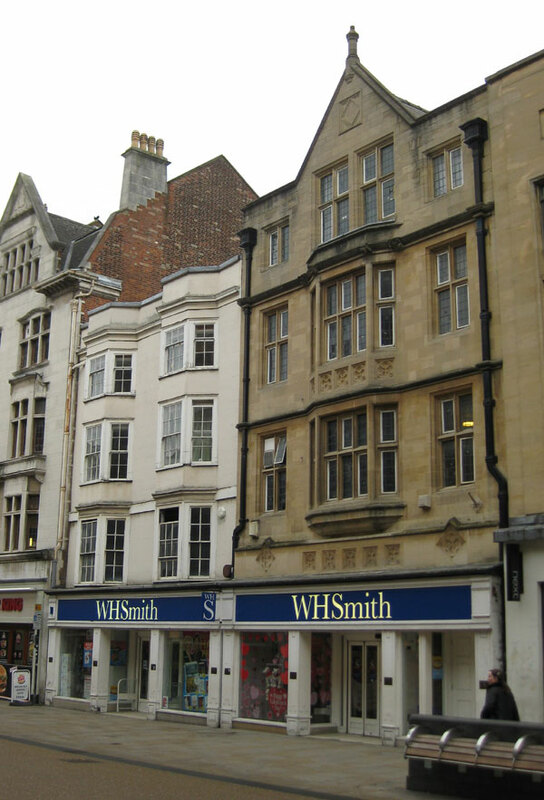 The photograph above, taken in 2009, shows the shops at 22 and 23 Cornmarket occupied by W. H. Smith & Son. The present shop-front at ground-floor level dates from 1969. No. 23 to the north is a Grade II listed building (list entry 1185685). It is in origin a seventeenth-century timber-framed house which was refronted in the eighteenth century and since restored. A seventeenth-century staircase and some eighteenth-century panelling survives at the back. Both houses on this site have always been in the parish of St Michael-at-the-Northgate Church. In 1772 a survey of every house in the city was taken in consequence of the Mileways Act of 1771. According to Salter, 22 Cornmarket was then in the occupation of Mr Clark, and had a frontage of 9 yards, 0 ft. and 3 in., while No. 23 was occupied by Mr Terry and had a frontage of 9 yards, 0 ft. and 5 in. The grocer Richard Cross was here from at least 1839 to 1881. He was followed by the wine & spirit merchant William John Mayo. For an advertisement for the ales of William Mayo who was at 22 Cornmarket Street from 1890 to 1914, see Michael L. Turner and David Vaisey, Oxford Shops and Shopping, page 29, illustration 61. W. H. Smith had moved into No. 22 by 1921. In 1968 Jesus College was granted permission to extend and rebuilt No. 22 (68/18400/A_H). A branch of Gillman & Son, boot & shoemakers, was at No. 23 from at least 1890 to 1936. The firm started business in Holywell Street in 1861, then moved to George Street, and finally to 12 Broad Street, where they remained until their closure in 2002. For a bill from from R. Gillman dated 1891 when he was at No. 23, see ibid., p. 81, illustration 78. The draper Charles Andrews then moved in. By the late 1970s W. H. Smith expanded their shop at No. 22 to include No. 23 to the north. Occupants of 22 Cornmarket and 23 Cornmarket Street listed in directories etc. No. 22 was occupied by the grocer Richard Cross (25) and his wife Ruth (20) with a shopman William Tarrant and one female servant. In “Part of Cross House” is the architect John Dooricks (35) with Elizabeth (30), John (4), Edward (3), and one female servant. No. 23: Jonathan Fiske, a tailor, lived here with Esther (60), John (c.20), his son and assistant, and Frederick (c.20). Also in the household were Marshal Spink (15), James Brown (who worked in the shop), and three female servants. No. 22: Richard Cross (38), grocer, still lived here with his wife Ruth (32) and their children Thomas (8), Ruth (7), Elizabeth (5), Richard (4), Priscilla (2), and Jane (1). They had two female servants, and a shopman lodging with them. In the other part of the house were two visitors: William L. Wigan, the Vicar of East Malling in Kent, and his wife Caroline (20). No. 23: John M. Fiske (34), a woollen draper described as the son of the head of the household [Jonathan Fiske], lived here over his father's shop. No. 22: Richard Cross (49), grocer, still lived here with his wife Ruth (44) and his children Thomas (18), who was a grocer’s assistant, Ruth (17), Priscilla (12), Ellen (9), Samuel (8), Sarah (7), Fanny (4), and Jane (six months). They had two house servants, and and an apprentice, Samuel Dutton (15), also lived with them. No. 23: John Marshall Fiske (44), a woollen draper who now employed twelve men, was still unmarried and continued to live here over his shop with his mother Esther (81), one draper’s assistant, and two house servants. No. 22: Richard Cross (57), grocer, still lived here with his wife Ruth (54) and their children Thomas (28), who was his father's assistant, Elizabeth (25), Priscilla (22), Helen (19), Sarah Ann (17), and James (14). They had two servants, and a grocer's shopman lived with them. No. 23: John M. Fiske (54), woollen draper, still lived here with one servant. Living with him was a shopman who worked for him. No. 22: Richard Cross (68) still lived here with his wife Ruth (63) and their daughter Ruth (37) and son Samuel (27), described as a grocer’s assistant. They had one general servant. No. 23 was occupied by Emma Parker (a widow of 50), described as both the head of the household and a housekeeper, and her unmarried sister Sarah Ann Parker (38), a confectioner’s assistant. No. 22: William John Mayo (35), wine & spirit merchant, lived here with his son Guy (8) and a sick nurse and a general servant. His wife Fanny was paying a visit with her father to Matlock, Derbyshire. No. 23: Richard Gillman (73), bootmaker, lived here with his wife Mary (73) and their unmarried daughters Mary (36) and Rose (34). They had one general servant. No. 22: Charles Andrews (51), a draper, lived here with his wife Charlotte (51), who was a milliner. They had two domestic servants, and a milliner and a saleswoman also lived with them. No. 23: Harriet Gillman (54), a widowed shopkeeper (and employer) at the bootmaker's below, lived here with her children Olive (15) and Ronald (14), plus a housekeeper and general servant. No. 22: Charles Andrews (61), a fancy draper, still lived upstairs in twelve-roomed premises with his wife Charlotte (61), who was a milliner, as well as an assistant milliner, two saleswomen, a cook, and a housemaid. No. 23: No listing: possibly it was part of No. 22 upstairs.